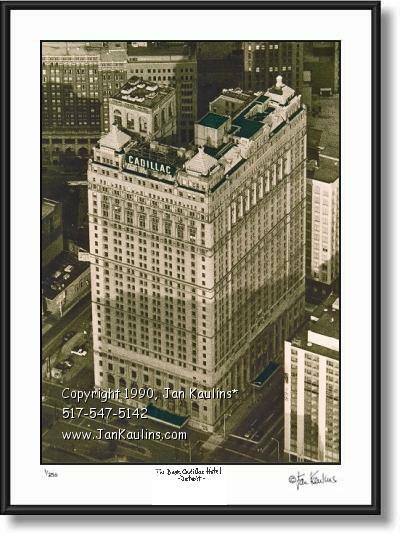 BOOK CADILLAC HOTEL photo picture Detroit Book-Cadillac Hotel picture photo art print for sale: Old Book-Cadillac Hotel picture art photograph print - Detroit Book Cadillac Hotel photo pictures art photography print for sale: This Detroit Book-Cadillac Hotel picture photo is an aerial Detroit picture photograph of an original black and white photograph that has been tinted and hand-colored. In this unique aerial Detroit Book Cadillac picture photograph the viewer is looking down at the historic Book-Cadillac Hotel in downtown Detroit, Michigan. This aerial Book-Cadillac Hotel Detroit skyline photograph pictures the huge Cadillac marquee that has looked over Detroit since the Book-Cadillac was built in 1924. TO SEE THE MANY OTHER DETROIT PHOTOS AVAILABLE IN THE DETROIT PHOTO GALLERY, CLICK ON THE 'HOME - Return To All Galleries' LINK BENEATH THIS PARAGRAPH, AND THEN CLICK ON 'DETROIT PHOTO GALLERY'.